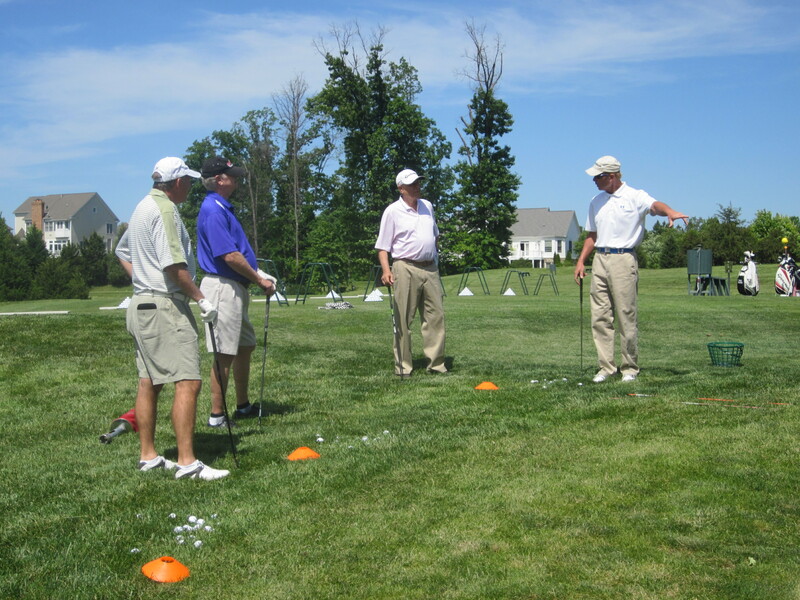 Recently I organized a one day travel golf school to Stonewall GC with our membership and host Director of Instruction, Erika Larkin, PGA. We could not have had a better day, the weather was perfect. 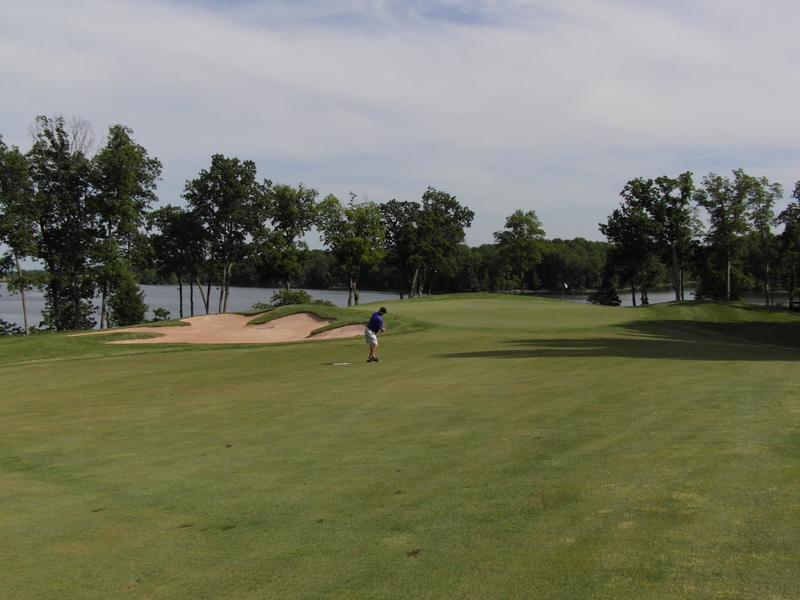 Stonewall is a very nice daily fee facility located in Gainesville, VA set along Lake Manassas. Lake Manassas in the background, very pretty! We started the day at 8:30 for a morning session on putting, wedging and then full swing instruction. After a lunch break, we then proceeded to the golf course for an 18 hole playing lesson with our students. Erika Larkin was a wonderful host and had everything set up perfectly so things went very smooth. She is a great instructor who is making quite a name for herself. We are planning more of these, next one will be on Friday, October 5th with the same format. We are limiting the size of the class to 6 students so if you are interested, let me know early as this will sell out fast. Another exciting Masters this year! Without a doubt the best televised golf event of the year with the beauty of the course and the coverage. The rare “double eagle” by Oosthuizen and the shot by Bubba in the playoff on #10 with the hooked wedge from the trees were just crazy. 1) He is basically self-taught. I am not sure I believe that he has never had a lesson. Maybe not in the sense of a structured time on the tee with a swing coach. But I have to believe through all his younger days, he must have picked up pointers just by watching others, reading and talking with his fellow competitors. I suppose you could call all of those experiences, “lessons”! Being somewhat self-taught myself, that is exactly how I developed as a player in my early days. I spent a lot of time working in front of a mirror to perfect my fundamentals. I also, read everything I could, listened to the older players at the course I practiced at and attended Tour events when I could to observe the best and copy their actions. Having done things myself, it may have taken longer but I think it helped me become a better teacher having gone through a lot of changes and different techniques in the quest to get better. The lesson here for everyone is that you must take it upon yourself to learn the game in many different ways, not just from a swing coach. 2) Bubba plays all kinds of shots and is not afraid to try them. I really love this because I try to teach almost all of my students to work the ball in different trajectories and curves. I feel you can become more self corrective if you can accomplish that. Hitting a perfectly straight shot requires in a sense, a perfect swing. Bubba has said this himself and claims it’s the reason he always tries to curve the ball. It does take some time and understanding of the ball flight laws to learn to work the ball but in the long run it is the best way in my opinion. Even short game shots like flop shots, bunker shots and low running chip shots are hit using techniques that put different types of spin on the ball. All the more reason to learn to work the ball in different ways! 3) Bubba uses a swing that suits his body type. Bubba makes full use of his arm swing! The extremely upright, more vertical arm swing is a good fit for his lanky body build. This arm swing creates tremendous swing arc which is one of the big reasons for his amazing power. Typically, shorter golfers will tend to be more rotary in creating power and taller players use a lot of arc and leverage. Either way works! The key is to fit the proper swing style to the particular body type in my opinion. This will make for a more natural swing feel to each particular student. Bottom line, if you have long arms, use them and allow them to swing off the body and create arc. The arms will just need to re-connect closer to the body as you approach impact and that is easy to achieve. Here is a recent addition to my lesson tee, very exciting! 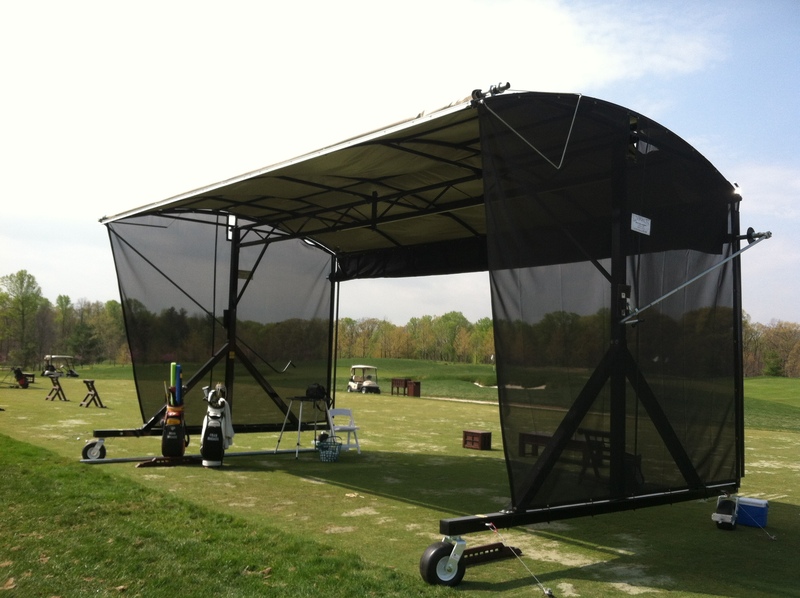 New “Covershots” canopy for lessons. 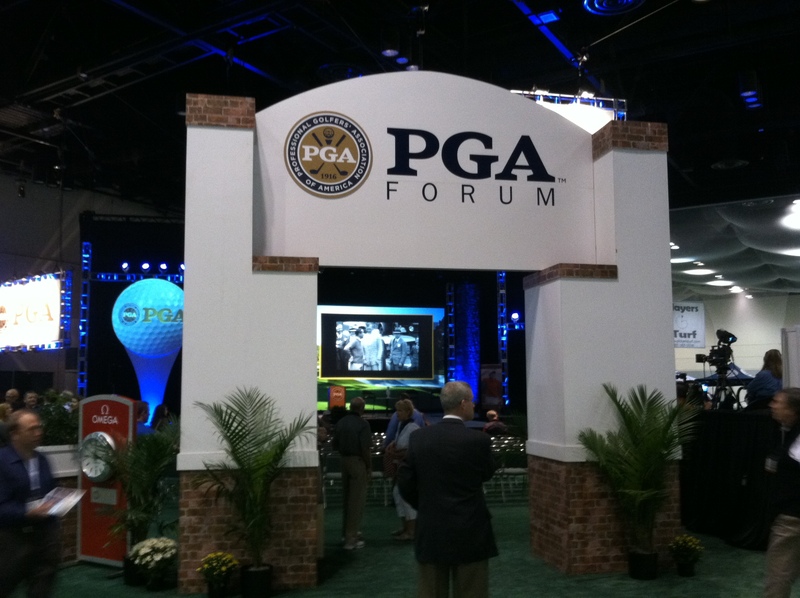 Recently, I attended the PGA Show in Orlando, Florida. Seeing everything due to the enormous amount of vendors is impossible but it is a great experience to see what is new in the golf industry. You can tell that there is a lot a creativity going into each of the companies booth space for their big week. Going through the TaylorMade/Adidas/Ashworth section was a lot like entering a theme park! 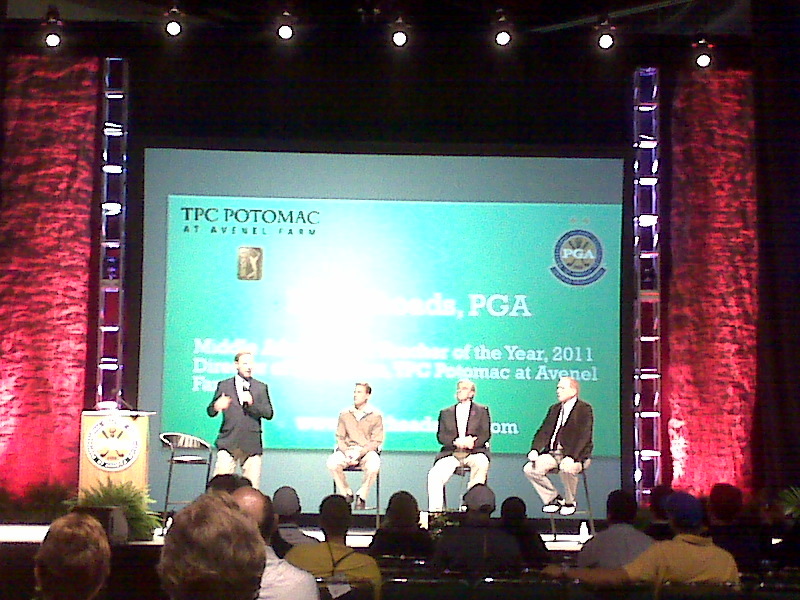 I was invited to to do a part on the PGA Forum panel for Teaching “Best Practices” on the Forum stage. I shared some of the programs we have done at my club in a photo slide show and took a few questions from those in attendance. 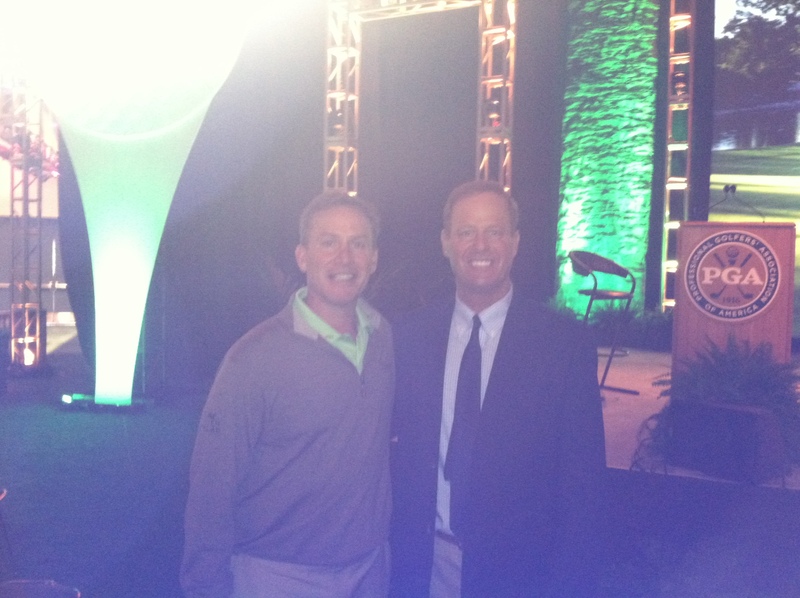 The cool part was meeting and being introduced by Michael Breed who we all know from the Golf Channel. He is just like you would imagine, very personable and full of positive energy. He moderated the presentations that myself and two other “Teachers of the Year” from other sections of the country had prepared for sharing with the attendees. On stage with Michael Breed, Rick Barry and Brad Patterson. 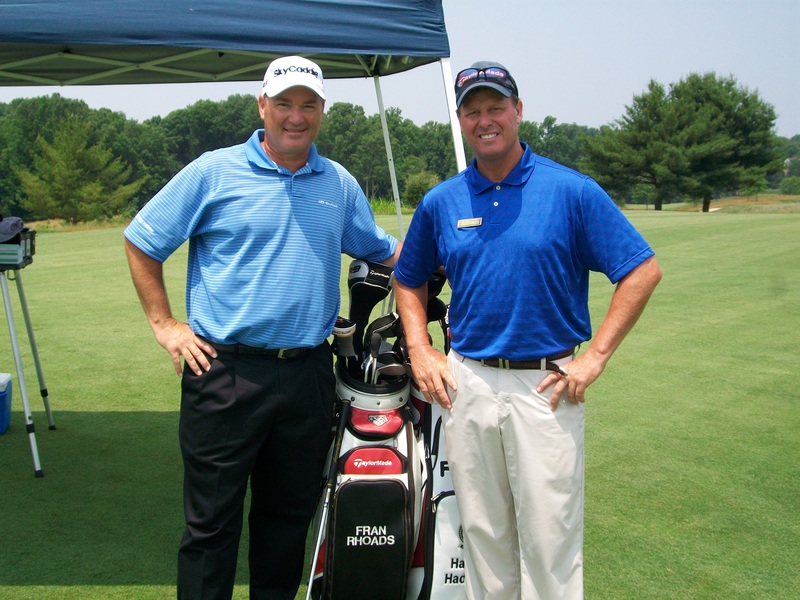 One of the “Best Practices” I shared at the PGA Forum was a special putting school I did with PGA TOUR caddie and advisor to SkyCaddie, Mark Long. He is best know as Fred Funk’s longtime caddie and the author of the Tour yardage books. Well, I finally put together a blog/website! Welcome to the 21st Century Fran, haha! This past year was very exciting for me highlighted by being selected as the Middle Atlantic PGA “Teacher of the Year” for 2011! It is a great honor and I have so many to thank who have helped me become a better golf instructor over the last 27 years. A very special thanks goes out to all my students who have made me a better instructor with each day that I spend with them on the lesson tee. Hopefully, I have made them better as well! I just finished up my 15th season here at the TPC Potomac at Avenel Farm, time really flies and I am proud to be associated with such a world class facility. Our newly renovated facility is very challenging and very beautiful so even if the score is higher, so is the experience! I made a new commitment to my physical condition this past season in order to improve my game and overall health. I am off to a good start, now need to keep it going through the winter and into 2012!